We’ve done it again! For the second consecutive year, Absolute Perfection has been named on the 2016 Inc. 5000 List of America’s Fastest-Growing Private Companies. It’s an achievement worth bragging about and we’re not the company to keep these things quiet! With a growth of 152% over three years, we’ve made it to 2379 on this year’s list. 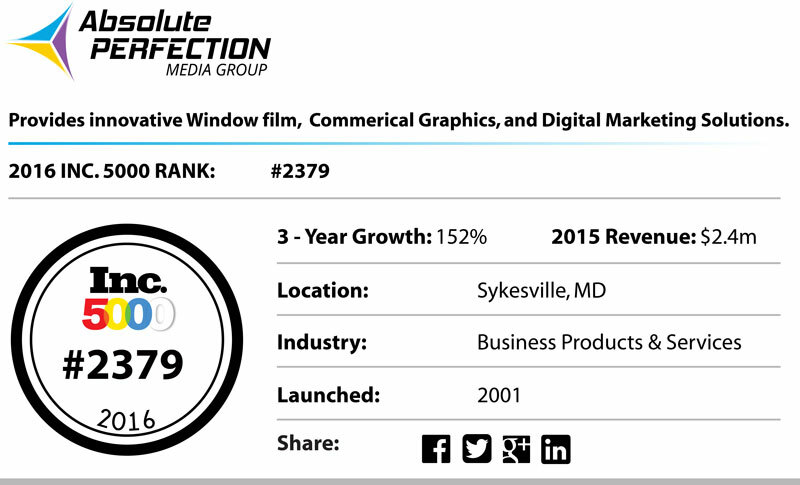 That’s a lot of dedication and hard work put in by the Absolute Perfection team and shows that our commitment to continued diversified development in the digital media, window tinting, and commercial graphics industries is paying off. Inc. 5000 is one of the most respected awards for private businesses in the US. Just to be able to enter, a company has to show the first year of revenue over $100,000 and by the third year that revenue has to grow to over $2 million. Only privately held for profit, US-based, independent companies may be considered. The final rank is attained by the percentage growth each company has achieved over the last three years. Bill, along with team members Tim Cooke (COO), Chris Fong (VP, Commercial Graphics) and Becky Duke (Strategic Account Manager) will be attending the Inc. 5000 Conference in San Antonio in October to celebrate Absolute Perfection’s success with other honorees. The conference brings together entrepreneurs with founders and CEOs of prominent companies. Keynote speakers include best-selling author and strategist, Tony Robbins; founder and CEO of Herjavec Group and investor in Shark Tank, Robert Herjavec; co-founder of Marvell Technology Group, Weili Dai; and co-founder of New Belgium Brewing, Kim Jordan. This is a thrilling accomplishment for Absolute Perfection, something that couldn’t be achieved without the support of our clients. We plan to keep building on our success for many years to come!